There’s a new appellation in British Columbia. Well, okay, it’s not really that new – two years old actually. But it arrived with so little fanfare, many people are still not aware of its existence. Even Appellations America only recently learned of the new designation that it says currently encompasses just over 100 acres. The Gulf Islands now officially join the Okanagan Valley, Fraser Valley, Similkameem Valley, and Vancouver Island to become British Columbia’s fifth VQA Appellation of Origin. According to Harry McWatter, founder of Sumac Ridge Estate Winery in the Okanagan and an acknowledged BC wine industry leader, one reason for the designation was a response to the fact some Gulf Island wineries did not want to be simply lumped in with Vancouver Island. Keith Watt, owner of Morning Bay Vineyard on Pender Island is reported to be delighted with the new appellation. “I believe the wines of the Gulf Islands have their own unique character, different from Vancouver Island wines and Fraser Valley wines. The ocean breezes, the soils, and the long, cool Mediterranean climate interact to create wines I believe will meet with great customer interest,” he said in an interview with Appellations America. 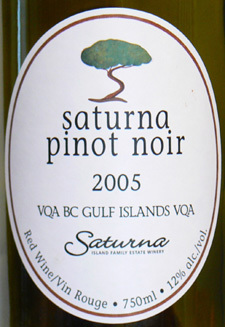 First to incorporate the new designation on their bottles was Saturna Island Family Estate Winery with their 2005 Pinot Noir. 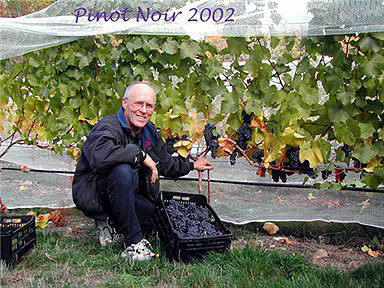 Since then, Salt Spring Vineyard (shown above left during harvest)have followed suit. For now, these remain the only two out of a growing number of wineries located on the Gulf Islands to be members of this appellation, but it will definitely be interesting to watch how many additional wineries come on board over the coming months. The mild climate of the Strait of Georgia is very conducive to grape growing although scarcity of water and extreme aridity in summer present challenges. Like the Okanagan and Fraser Valleys, the Gulf Islands region had a well-established fruit-growing and market gardening tradition in the late 1800s. Vineyards and wineries now are found on many Gulf Islands including Salt Spring, Pender, Saturna, Quadra, and Bowen with varietals planted included Pinot Noir, Pinot Gris, Gewurztraminer, Riesling, and Chardonnay. This entry was posted in BC Wine Institute, Morning Bay Vineyard, Salt Spring Vineyard, Saturna Island Winery, Sumac Ridge Estate Winery, VQA, Wine appellations and tagged British Columbia, Fraser Valley, Gulf Island, Okanagan, Pender Island, Pinot Noir, Sumac Ridge Estate Winery, Vancouver Island. Bookmark the permalink.